Mercury’s performances leave maddening effects on audiences around the world. Although his reputation for causing nervous system damage and birth defects precedes him, many still don’t appreciate Mercury’s continued stardom. A slick character, his metal beginnings are as a shiny, silvery, odorless liquid, but he’s versatile enough to become a colorless, odorless gas when heated. And with this leading man’s temper, that happens all the time. His airborne roles occur during coal burning and waste incineration. Keep an eye out for him in fluorescent light bulbs, thermometers, dental fillings, batteries, auto switches, and more. With the help of bacteria in the environment, Mercury shows his versatility by changing roles to Methyl Mercury where his toxic charms are most apparent and damaging. Wearing this outfit, Mercury builds up, or bioaccumulates, in fish and other animals and gets passed up the food chain where people get more exposure than they bargained for, including in your tuna fish sandwich! He is found in almost everyone’s body, demonstrating his ability to really get under your skin. So, combined with airborne effects, Mercury puts about 60,000 children born each year at risk for his harmful and potentially permanent neurodevelopmental effects. With his staggeringly effective performances, this special kind of actor drives audiences crazy. 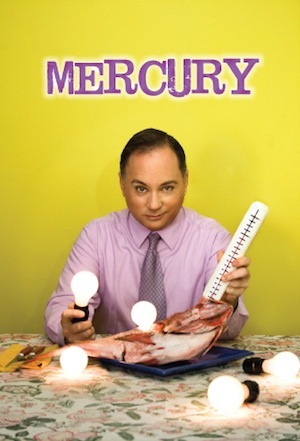 Don’t let Mercury get to your head…the nervous system is very sensitive to all forms of this bad actor! Methylmercury and metallic Mercury vapors are more harmful than other forms because more Mercury in these forms reaches the brain. At particular risk is the young child or fetus whose organ systems are still developing. Short-term exposure to high levels of metallic mercury vapors can cause lung damage, nausea, vomiting, diarrhea, increases in blood pressure or heart rate, skin rashes, and eye irritation. Mercury’s harmful effects that may be passed from the mother to the fetus include brain damage, mental retardation, loss of coordination, blindness, seizures, and inability to speak. Saving energy has given this bad actor an unexpected reprise. As more people switch from standard light bulbs to compact fluorescents, which contain Mercury, there is increased concern about disposal. Recycling rates for these energy-saving bulbs are reported to be very low. More than 60,000 children are born each year at risk for adverse neuro-developmental effects due to in utero exposure to Methylmercury. 1.16 million women of childbearing age eat enough Mercury-contaminated fish to pose a risk of harm to their future offspring. In March 2011, the U.S. Environmental Protection Agency (EPA) proposed the first-ever national standards for Mercury, arsenic and other toxic air pollution from power plants. The new standards would require many power plants to install widely available, proven pollution control technologies, such as smokestack scrubbers. Mercury’s slippery agents include the Chlor-alkali Industry, Chemical Manufacturers, Electric Reliability Coordinating Council, Edison Electric Institute, Dental Amalgam Manufacturers, Iron and Steel Producers, Auto Makers, Incineration Industry.